Slide behind the wheel of a 2015 Ford Taurus in Surprise, and you will wonder whether you are driving a big sedan or a luxury car. 2015 Ford Taurus reviews mention that cabin has a dignified feel and the soft-touch materials, chrome and wood-toned accents fit well. The availability of options like massaging front seats and a heated steering wheel heighten the sense of luxury. The Taurus gives a ride that is quiet and comfortable. Handling is confident, delivering a nice balance of a serene cabin and adept handling. Ride quality is augmented by Ford's Torque Vectoring and Curve Control. Every 2015 Ford Taurus comes standard with antilock disc brakes, stability and traction control, front seat side airbags, full-length side curtain airbags and integrated blind spot mirrors. A rearview camera is now standard across all trims. Of course, there is a nice package of technological goodies. The Taurus includes three 12-volt power sources that provide power for video games, computers, cell phones and other electrical devices. Also standard is the MyKey system, allowing owners to define parameters for vehicle speed and volume controls for secondary drivers. 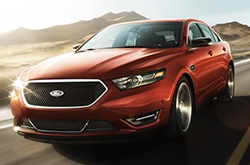 The 2015 Ford Taurus is powered by a 288 horsepower 3.5-liter V6 engine. A 2.0-liter turbocharged EcoBoost four-cylinder that generates 240 horsepower is also available. 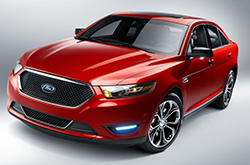 The 2015 Taurus SHO is equipped with a mighty 365-horsepower 3.5-liter turbocharged EcoBoost V6. Six-speed automatic transmission is equipped standard with all three engines. Front-wheel drive is standard but all-wheel drive is optional. 2015 Ford Taurus reviews highlight that the wide array of choices gives Ford an edge over the take-it-or-leave-it competitors in the class. As one of the most established nameplates in its class, the Taurus is an icon for American big-car motoring. With ample power and a smooth, quiet ride, the miles melt away. Cruise in comfort and style. 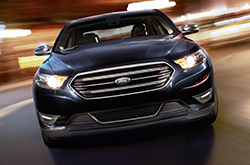 See the 2015 Ford Taurus in Surprise at Surprise Ford. We're certain that the Taurus is perfectly designed for you. That's why we would like you to compare Ford's newest model head-to-head with the 2015 Buick LaCrosse, Volkswagen Passat, Hyundai Genesis, Chrysler 300 and the Toyota Avalon. The Taurus's eye-catching looks, state-of-the-art cabin amenities and affordable MSRP are sure to win over AZ shoppers. Many drivers in Phoenix choose it because it's a fabulous value; compare its price to the vehicle options listed above to see for yourself. Find out more information about what it offers in our bullet list below this paragraph! Surprise Ford is your source for 2015 Taurus reviews and car comparisons. Not all Phoenix car dealerships are alike. We differ from others in that we feel it's our responsibility to serve customers with quality reviews. Jam-packed with up-to-date information and specs, each article gives you complete details about all the Taurus has to offer Phoenix drivers in terms of mpg and much more. Discover all about our entire line of highly-rated automobiles! If the Taurus isn't the right choice for you, we've got many other Ford reviews and car comparisons. Visit our research directory to view them now!